The Earth is a complex planet to render. There are large land areas of varying color, and it can be difficult to find a suitable texture map in the public domain. There are vast areas of open water which are both specular and reflective. 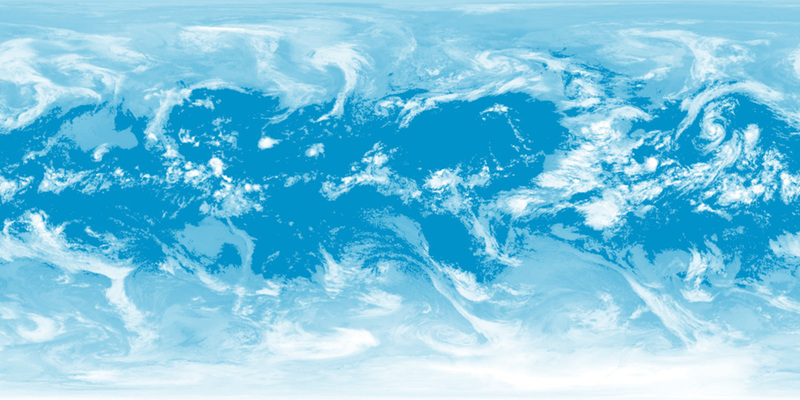 The planet is shrouded by layers of complex clouds with varying opacities. And the planet is blanketed by a thick atmosphere. I have gathered together all of the public domain data to create this synthesis of images which, while not accurate or true in the strict photographic sense, is never the less detailed and aesthetically "correct." If you are wondering where the Moon images went, they are now located further down this same page. The 1K versions of these images are free. Bandwidth costs force me to charge a nominal fee for the high resolution versions (2K, 4K and 10K). Please note: When you get to the end of the PayPal process there will be a "Continue" button on the lower right side of the screen. When you click the "Continue" button you will be brought to the page on this site where you can download the larger image maps. This map is a synthesis between my original earth map, gradient mapping of the USGS DEM information, hand painting, DEM modulation of detail, bathyspheric depth information, and the USGS Ocean clip. Bathyspheric data was used to modulate the color of the water so that deeper areas are a darker blue than shallow areas. To download, right-click the image and chose "Save Link As..."
This is pieced together exclusively from the USGS DEM database. It contains landmass elevations only, with the ocean at zero, and the top of Mt. Everest at 255. 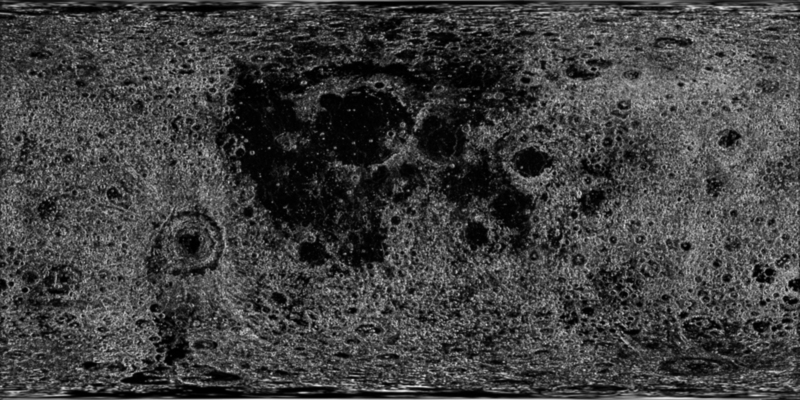 Use this as a bump map to give the appearance of the Earth's rugged surface features. 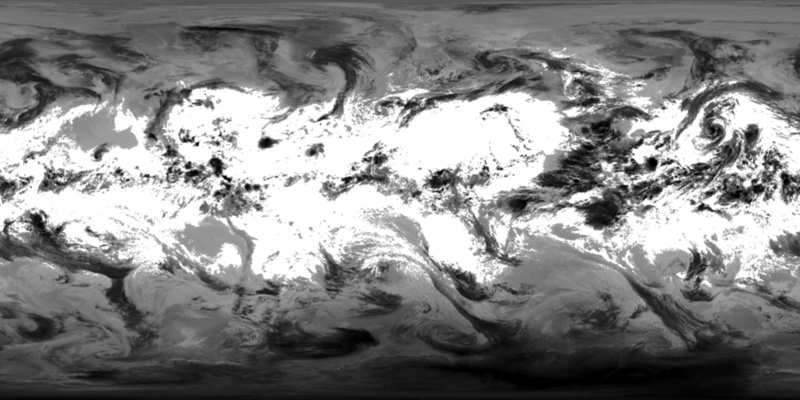 Some madmen have also used this data in POV Ray as a displacement map on a very finely divided sphere to produce a "true" 3D version of the Earth. The 10K version is VERY large, so make sure you really need that much detail. 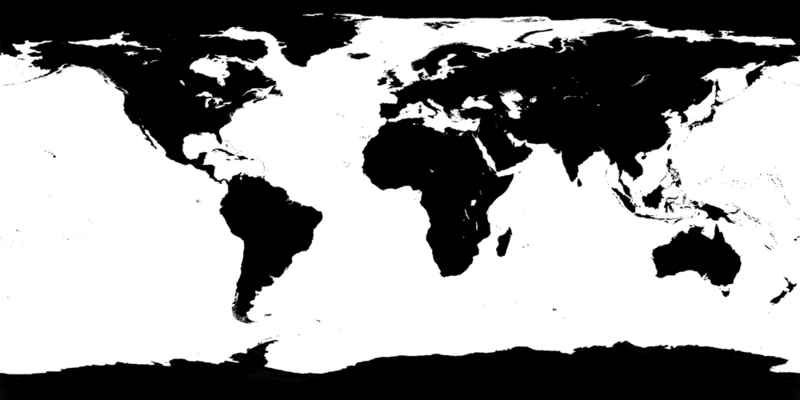 This is derived from USGS DEM data, with the addition of the Arctic ice areas which do not show up on USGS data (since they are not solid land masses.) Use this to control specularity and reflectance of the ocean surface. 1024 x 512 color image. 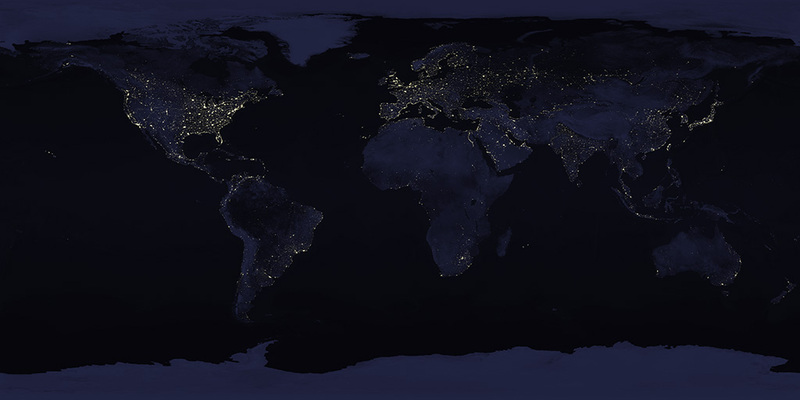 Very similar to the night lights map as published by NASA on their Blue Marble Page. 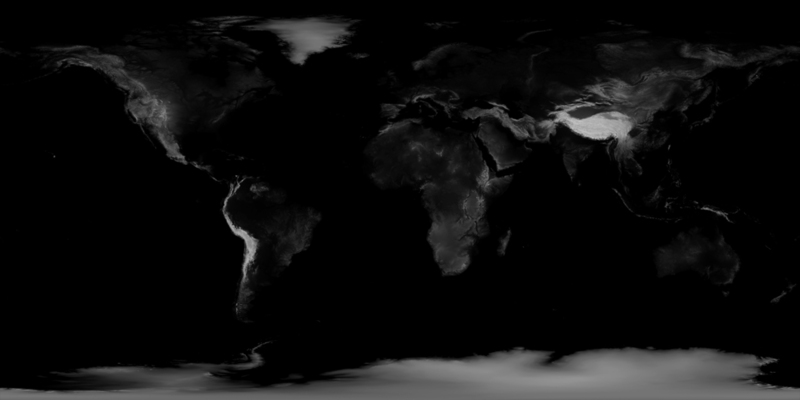 I took their 30000 x 15000 black and white city lights map, and adapted it with a color table to a colorized version of my earth color map. 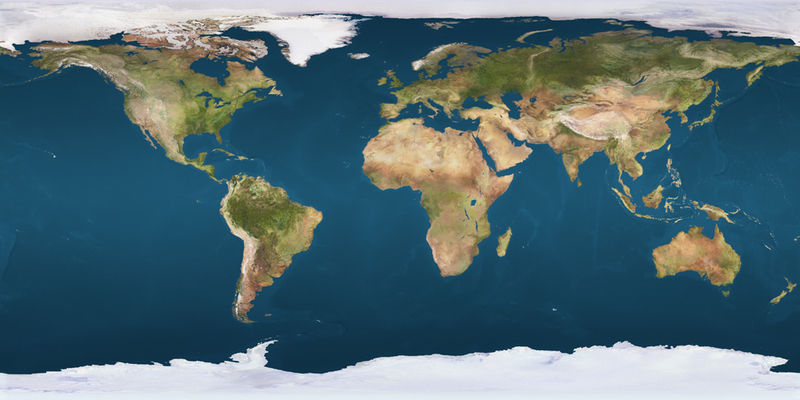 This comes in 2k, 4k, and 10k versions in color, as opposed to the maximum 2k size of the NASA version of this map (higher resolution versions are available on the paid page only because of their size). Be sure to have a look at the tutorials page for a special rendering tip for using this map. 1024 x 512 color image. Based on a mosaic of satellite data, colorized, data errors retouched out, and fixed for seamless wrapping. 1024 x 512 greyscale image. Based on the same data as the color map, but leveled for the purpose of transparency mapping. The Moon is a tricky planetoid to render. It has a very distinctive albedo which remains constant across its lit side, regardless of the angle of the surface to the sun. Therefore, standard rendering lighting models do not apply, as they always have a characteristic drop off in intensity as the angle of incidence to the light source increases. In Lightwave, there is an option to use a "non-Lambertian" lighting model on a surface setting. In previous versions of Cinema4D, you had a contrast control in the lighting setup. More recent versions of Cinema4D feature an Oren/Nayar illumination model in the lighting setup which allows you to simulate the lighting properties of "rough" surfaces. This is the method I used on the same pictured here. 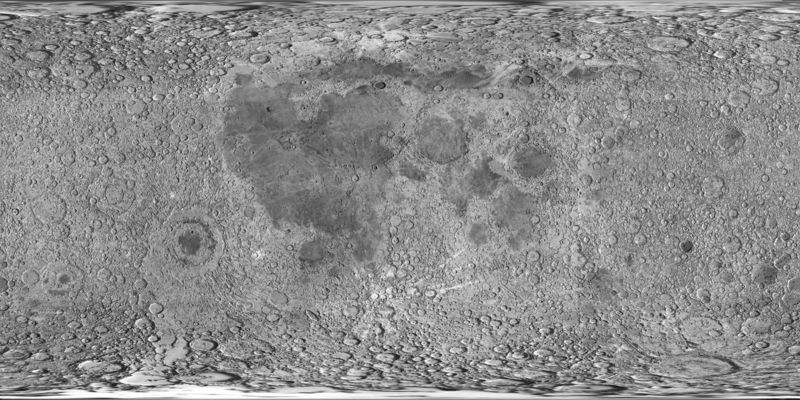 This map is based on a mosaic of satellite data, retouched for visible mosaic seams and for problems with the wrapping seam. Since this image contains highlight and shadow information independent of the location of your light source (inevitable because of how the moon is illuminated by the sun), you'll need to be careful how you light this so you don't break the illusion. To download, right-click the size you want and chose "Save Link As..."
This map is my attempt to derive bump information from the above map. I did a high-pass filter operation to find all the edges of the craters, and then curved the result so that blacks and whites were white, and mid-tones were black. The results came out pretty well, as you can see from the sample image above.